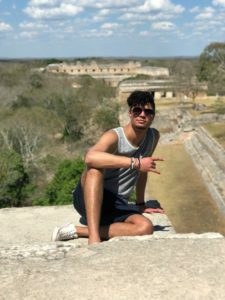 Visit to Uxmal, Mérida, and a Hacienda! Hey everyone! So happy to report that I’m very much enjoying 96° weather! Mexico has been awesome. There is a rich diversity in Mexican culture: 62 different pre-hispanic ethnic groups and 62 different languages exist here. To follow up with my previous hope, I have not tried the traditional Mexico chocolate mole. I learned that the Yucatecan culture and food are very different from those in the rest of Mexico. Chocolate mole is not popular here in the Yucatán, however a variation called “green mole” is served, made with pumpkin seeds. 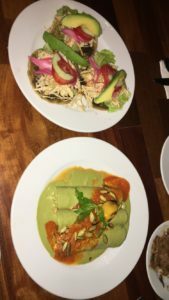 Panuchos and green mole flautas! It is a common misconception that, when the Mayan civilization crumbled in 1564, the Mayan people disappeared with it. This is most certainly not the case! The Mayans still live on here in the Yucatán, proudly preserving their traditions and beliefs. Our guide Carlos considers his nationality to be “Mayan” and not “Mexican”. Standing at the entrance of the Pyramid of the Magician! Uxmal was amazing! We saw the Pyramid of the Magician, which was adorned with repeated sculptures of the Mayan Rain God Chaac. 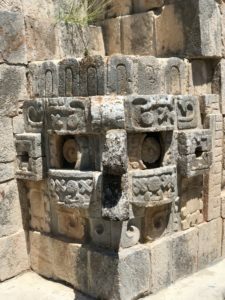 These were visible only from a certain angle, suggesting that the Mayans understood optical illusions and perspective. The Pyramid of the Magician with the repeated Chaac symbols. We strolled around the Quadrangle (Uxmal’s town square). There we saw where the Mayans played Poc-ta-poc, their traditional game involving throwing a ball through a stone ring many feet in the air without using their hands. 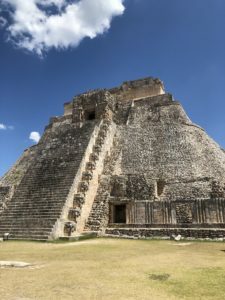 Finally, we climbed La Gran Pirámide de Uxmal which overlooked the entire city. On the top of La Gran Pirámide de Uxmal! We visited a hacienda, a house on a plantation that grew sisal and produced sisal rope during the 19th and 20th centuries. Sisal was grown extensively in the Yucatán, deprived of rain for long periods, but nevertheless thrived in these periods of drought. Its production was central to the Yucatecan economy, just as “King Cotton” ruled in the Southern United States prior to the Civil War. Unfortunately, just as in the United States, this production was facilitated by the use of slaves. 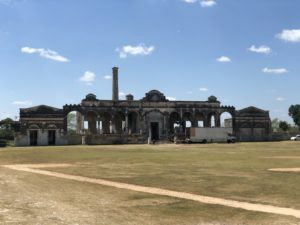 Consequently, some Mexicans view this period of Yucatecan history with pride because of its prosperity, while others view it with embarrassment because of its use of slavery. The remnants of the Hacienda. 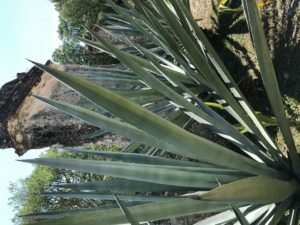 The sisal plant up close, still on the plantation. We visited a cemetary near Mérida. Our guide Carlos told us that it becomes very busy on November 1st and 2nd, which is the Día De Los Muertos. As depicted in the movie Coco, this holiday is a celebration of the lives of passed family members. Members of the living bring offrendas, including chocolate and fruits, and leave them in the cemetery for those who have died. 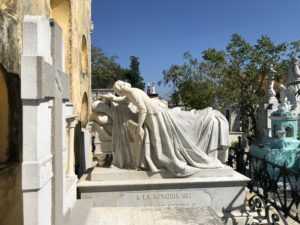 Beautiful piece of carved marble by an Italian artisan atop a Mexican grave. 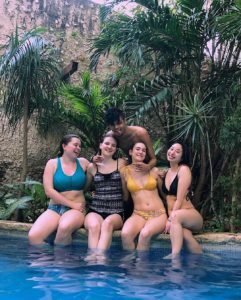 Back in Mérida, we went into the pool at our hotel and, later, went out on the town, exploring the square. Amanda, Jess, Elaine, Ann, and I at the pool! 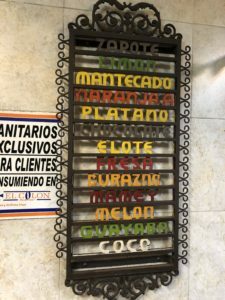 We saw a recreation of the game Poc-ta-poc, after which we went out to get some ice cream and milkshakes made with mamey (a pinkish-orange fruit with a large black seed in the middle with the taste of a sweet potato mixed with papaya). Click to see the locals playing Poc-ta-poc, the ancient Maya traditional game. The different flavors available for ice cream and milkshakes. I got the Mamey! 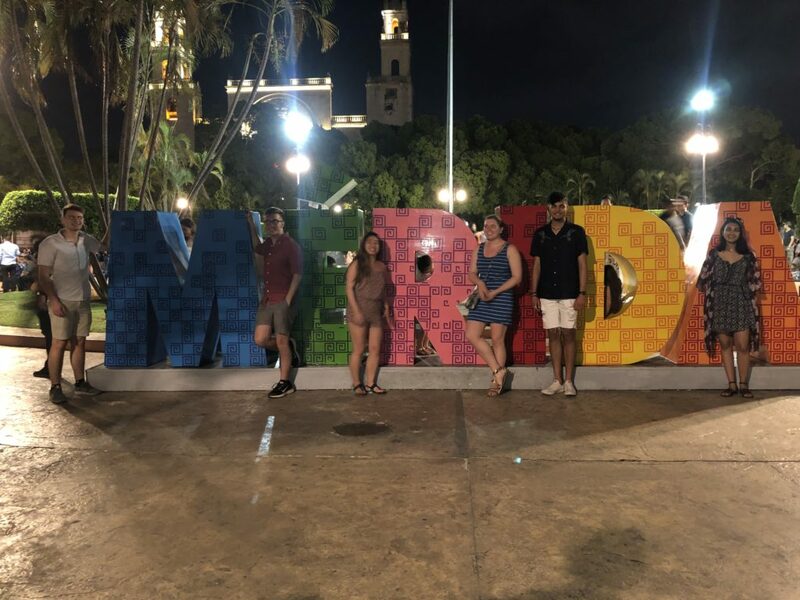 Here we are in front of the Mérida sign in the town square. I love all the people on this trip. We’ve all been getting along very well and we all can’t wait to spend the rest of the trip together doing amazing things! Interesting to learn that the Mayans and their culture exist present day! The Pyramid of the Magician is quite striking! Wonderful that you got to see the game of Poc-ta-poc played by the natives… hope they didn’t sacrifice the winning team😉 Looks like you are getting the flavor of region both gastronomically 😋 and culturally. Love your narrative and pictures! Happy to see that you are enjoying this educational experience with your fellow Honors classmates. Mangroves, Flamingos, and Meeting Lupita! 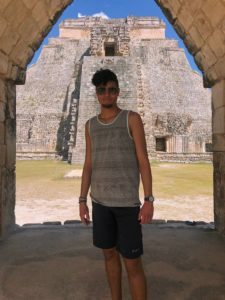 Chichen Itzá, Jumping in a Cenote, and a Biocultural Reserve!